"Close my eyes. Feel me now. 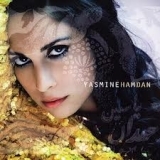 I don't know how you could not love me now"
Yasmine Hamdan (this album) (2012). Sorry, no matches on eBay for "Bala Tantanat Yasmine Hamdan".